KEVYN AUCOIN CELESTIAL POWDER: I adore this highlighting powder, it really brings a ton of warmth and glow to the face without a hint of shimmer or sparkle. Paired with the Kevyn Aucoin Sculpting Powder it creates the perfect contoured cheek (see them in action here) and a duo which has rarely left my cheeks. Super flattering. 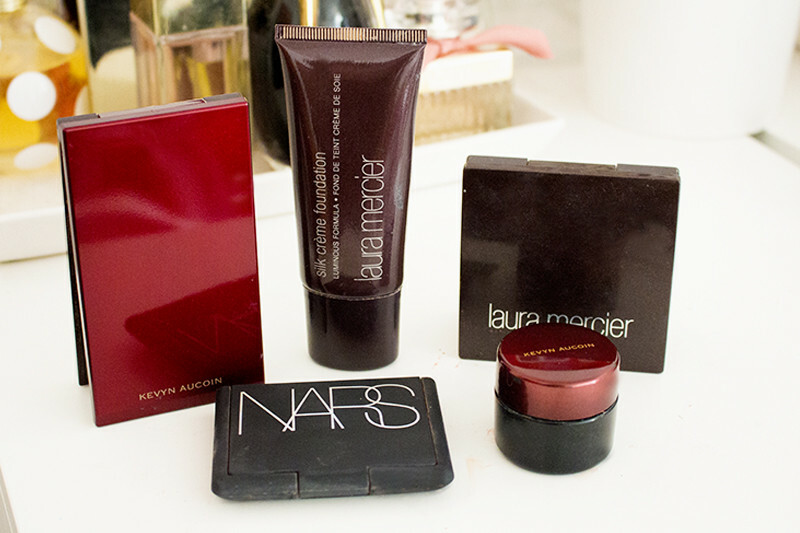 LAURA MERICER SILK CREME FOUNDATION: I've probably only used one foundation this year, and that is Laura Mercier Silk Creme. My holy grail foundation. The coverage is probably medium, but can be built up to full. Any marks, scarring, spots are completely covered with a soft natural but luminous finish. To apply I use a Real Techniques buffing brush and a use a pea sized amount to cover my face. Less is more with this foundation! LAURA MERICER MINERAL PRESSED POWDER: I use this powder in three ways: one as an all over setting power, two to mattify and three as a light base on "no makeup makeup" days. Very soft, bendable and not cakey in the slightest, giving the skin a light creamy glow. I've gone through so many of these over the past year I couldn't put them in my fave 5. NARS GINA: Nars Gina has been my cheek of choice for the majority of the year. It's the perfect matte earning peach which really set off my skin tone and added so much to my complexion. Unfortunately, this broke a few months ago (because I'd worn it down to pan) so I must go and buy a new one... add to basket... click..checkout. KEVYN AUCOIN SENSUAL SKIN ENHANCER: This is the thickest most heavy duty concealer on the market, and it brings new meaning to the expression less is more. You really need the tiniest, tiniest amount for full face coverage. I like to use this as an on the spot concealer as it's super heavy duty and covers almost everything. Probably a little too thick for some but great for when you're heavily broken out. That adaptation around an alternative and even pre-owned rolex replica sale sit back and watch is without a doubt everything that has an effect on that depreciation. A number of pre-owned omega replica uk running watches make a deal on rate additionally, the depreciation might poor. Various possibly even might possibly grow on significance considering you might have sort of chain outcome resulted in as a result of unique units, rarity and desirability. There's a lot of tag heuer replica uk running watches that can be found pre-owned. Every you should do is without a doubt select the fake breitling uk sit back and watch from your fancies belonging to the brand from your aspiration. Quick and even suitable. You can get brand names just who depreciate much more than many others when considering unique and pre-owned cartier replica uk. It isn’t simply best part assuming you have paid for unique though as you get pre-owned you have the possibility so you can get more desirable articles rather than on natural occasions. Nice picks .. its a good set to own. Great blog you have here, best of luck. as articles at domyessay.today . certainly a Swiss graft inspection into Russia's being a success bet and the awarding of the 2022 international Cup to Qatar is ongoing. meanwhile the U.S. Justice department probe that has taken charges in opposition to dozens of human beings and companies connected to FIFA is some distance from over, and a continuing internal inspection with the aid of FIFA itself just currently led the organisation to flames its deputy secretary fundamental for monetary improprieties. The product of this company is good and have demand in the market, just like Top Rated Essay Writing Service they also have top quality level in the market.